For Donald Duck’s Viennese uncle, Professor Ludwig Von Drake, “there’s no business like snow business,” especially when it comes to his quest to invent a form of snow that would never melt, regardless of what the temperature was outside. Eager to return to Mickey’s Clubhouse triumphant and ready to partake in an “Easy Freezy Snow Celebration” of skiing in the sunshine, Professor Von Drake ventures to Mistletoe Mountain to put his plan into action. Yet before he leaves the perpetually cheery, brightly colored, sunny and supportive surroundings of the Clubhouse, he enlists the help of his nephew, Mickey and the rest of their friends to either build or find something both large and efficient enough to haul back all of the snow that Von Drake will be developing. Hearkening back to vintage Mickey shorts which found him in the Buster Keaton influenced position of running a steamboat or taking on other modes of travel, Mickey dons the classic blue and white striped train engineer cap to conduct the operation via the same Choo-Choo Express style which influenced the film’s name. While in reality the program is designed to give children early problem-solving strategies, in the show a less obvious method is on display. Thus, Mickey’s constant usage of “mouskertools” (a nod to the live action classic children's favorite series the Mickey Mouse Club) assists him in repairs along with the advice that a plea of “Oh, Toodles” presents him with a variety of options on how to literally create and cross that bridge when the Choo-Choo comes to it. Most effective for children under the age of five as it’s not quite as compelling as other Disney offerings including its fellow December 1st companion release of another Disney Channel series in Handy Manny, the roughly fifty minute disc is equally beneficial in ensuring that children will further learn their shapes and colors by designing some aspects of the weakly plotted but toddler-friendly special specifically to help sharpen memory skills. Although overall, the program as a whole feels a bit weak with some musical numbers coming across as carelessly rushed-- best experienced in an embarrassing “Hot Dog Dance” that comes out of nowhere-- it saves itself by its emphasis on early learning. 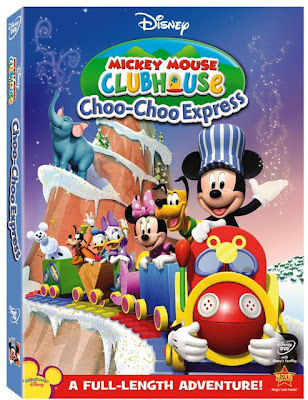 The educational component can be appreciated early into Mickey Mouse Clubhouse: Choo Choo Express, when we not only acknowledge that the Choo-Choo Express will be laying down tracks as it continues but in doing so, it demands that viewers are active instead of passive by inspiring us to memorize the order of a few colors and the patterns that develop as the railroad track moves from one color to the next and repeats. In this regard alone, Clubhouse feels like it can be viewed entirely as a nearly interactive version of Disney’s impressive collection of their character-based tactile, multiple player memory games. Additionally, it encourages children to learn to tell time and how to plan ahead for activities such as when the Clubhouse crew must follow a character and clock based train schedule to pick up passengers along the way. While older children will no doubt be bored, it’s ideal entertainment for toddlers that thematically ties into the holiday season when Santa and Mrs. Claus also hitch a ride on the “Choo Choo Express,” which is featured musically as a new song from They Might Be Giants. Tying in the idea of visiting friends and family and helping others out by working together, the disc includes the bonus episode of “Mickey’s Big Job,” which finds the group in literally over their heads while farm-sitting for Willie the Giant and trying to complete Willie’s daunting chore chart. Again taking an interactive approach, “Mickey’s Big Job” is even more hands on than the featured title since instead of merely pausing and inviting you to get involved intellectually, the age divided adventure modes allow you to choose the answers to problems raised simply by using the remote control. Although both Clubhouse and Handy Manny are sure to intrigue the young enthusiasts of both shows and are both suitable for the toddler demographic, this one risks skewering a bit too young so that those unfamiliar with the content may find that this one far more than Manny is more likely to be outgrown faster by preschool or kindergarten aged children and/or kids whose ability to grasp new knowledge is already quite rapid regardless of their age. However, despite the content suitability being best evaluated by parents or those who know the children in their lives the best (along with understanding the return policy if it’s way too simplistic), the one extremely impressive aspect of this special even more than the otherwise superlative Manny is that it manages to move a few steps beyond the beautiful animation of Manny for an experience that truly brings you the highest quality in a non-HD format. FTC Disclosure: To ensure that I had the right ticket to ride this particular Choo Choo Express to understand what the journey would be like for consumers, I was provided with a review copy of this title from WDSHE as is standard practice for film critics. Likewise, the receipt of this "ticket to ride" had no impact on whether or not the title in question received a favorable or negative response in my quest to get readers “all aboard” before they spent their hard-earned time and/or money without so much as a train schedule or Mouskertools from Toodles.